I’m interested in this too. Did you get it going ? I’ll need the code in c or c++, but I could do that if it works. Wonder why nobody did this before ? Sorry I took so long to reply. The pixy team already has this code in C/C++; in fact, it’s what I used to piece together my .NET version, although I wasn’t able to go back to working on it. Thanks for the post and for sharing your c# .net solution for Pixy camera. I have got some questions for you and I would appreciate you if you can advice me on them. I am looking for a good camera to embed in my robot’s eye to do some vision (image processing) with that. I need to recognize a few colored objects with and get the pixel address of them and keep track of the items in a room. Please can you tell me how Pixy is efficient in that? what is the detection range (in meter) that it is able to recognize colors? what is its FOV angles? Do you think if it is a right option to be integrated in a humanoid robot? or do you have any other suggestion for me? In future I will need to do face tracking… does it provide a Bitmap of the image frame to allow me to apply Opencv of for example Aforge? Currently I am developing my system under C .Net framework visual studio 2013. 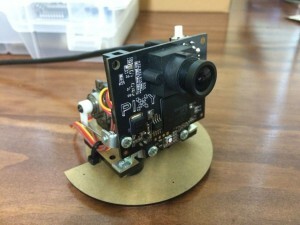 Pixy isn’t going to be good fit for advanced robot vision. It’s good for simple on board processing in detecting certain hues. I would use a regular webcam for your project. Hi Pablo, thanks for sharing this code. I just purchased my PIxy and would like to interface it with my favourite framework: TouchDesigner. I can read data from the USB via Arduino, but it is a slow solution so I would like to use something like your C++ application, just beacause TouchDesigner can include DLLs. Unfortunately I have 3 issues. Hi Pablo, I’m working agaib on Pixy porting to VS.
Can you please tell me wich versione of VS you used and wich SDK?